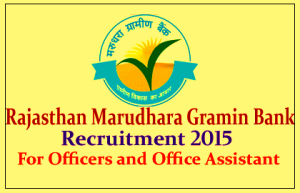 Rajasthan Marudhara Gramin Bank invites Online applications for the posts of Officer in Middle Management Grade (Scale III), Officer in Middle Management Grade (Scale II), Officer in Junior Management (Scale I) Cadre and Office Assistant (Multipurpose) from Indian citizens who have been declared qualified at the Online CWE for RRBs conducted by IBPS during September/ October 2014. Before applying, Candidates should ensure that they fulfill the eligibility criteria for the post. Candidates are required to apply online from 12-02-2015 to 26-02-2015. Before filling online application candidates must pay application fees by Challan. candidates may get their challan through this notification.Candidates must fill all details carefully in the online application. After compeliting online application candidates must take print out of application and keep for future use only. * For more details see official notice. Selection will be made on the basis of performance in RRBs- CWE-III conducted by IBPS in September/ October 2014 and Personal Interviews to be held in Jodhpur Centre. Candidates must have scores RRBs CWE -III 70 marks for SC/ ST/ SC-PWD/ STPWD/ SC-EXS/ STEXS/ and 80 marks for OBC/ GEN/ OBC-PWD/ GEN-PWD/ OBC-EXS/ GEN-EXS. Fee is For Officers - Rs. 20/- for SC/ST/PWD and Rs.100/- for all others. For Office Assistant,- Rs. 20/- for SC/ST/PWD/EXSM and Rs.100/- for all others. Requisite Application Fee may be paid any Branch of Rajasthan Marudhara Gramin Bank located in 15 Districts (i.e. Bikaner,Barmer,Dausa,Hanumangarh,Jaipur,Jaisalmer,Jalore,Jodhpur,Nagaure,Pali, Pratapgarh, Rajsamand. Sirohi, Sriganganagar & Udaipur) by given Payment challan. Candidates can apply online from 12-02-2015 to 26-02-2015.Before applying candidates must read the instructions carefully. Candidates must pay application fees by Challan made available by the bank. Candidates must fill all details carefully in the online application. After compeliting online application, take print out of application and keep for future use.